Abstract: As the leading brand in the self-balancing scooter market, Airwheel has released the very first sitting-posture self-balancing scooter-A3 on the basis of enterprising spirit and substantial technology strength. Airwheel A3 stands out among fierce market competition as soon as it came on the scene. Riding a scooter to travel around is one of the best leisure activities. Nowadays, the whole world advocates low-carbon and green travel. Then, Airwheel intelligent self-balancing electric scooter is the top choice. As the leading brand in the self-balancing scooter market, Airwheel has released the very first type of sitting-posture self-balancing scooter-A3 on the basis of enterprising spirit and substantial technology strength. Airwheel A3 stands out among fierce market competition as soon as it came on the scene. The reason why Airwheel A3 is designed into a sitting-posture one is to change the traditional “short-distance trip transport” role of self-balancing scooter. Once the range of scooter is lengthened, the previous standing-posture mode will make riders fatigued, which greatly affects riding experience and mood. However, the innovative sitting-posture mode offers a comfortable and relaxing riding experience, because it relies on hands, feet and hip to control the scooter. Thus, the burden is no longer concentrated on legs. 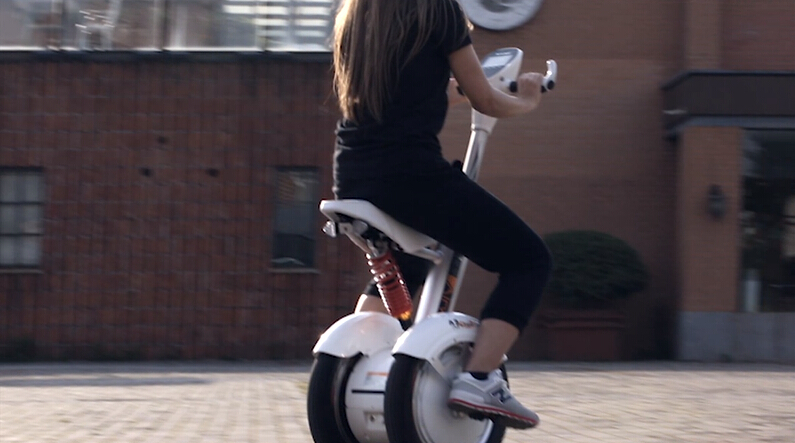 At the same time, Airwheel also takes female riders into full consideration and guarantees their feet touching the ground when the scooter brakes. Besides, the electronic brake system, hydraulic suspension system and automatic steering sensor system are introduced into Airwheel A3 electric scooter for the first time, which jointly ensure the safety and comfort during braking and riding process. In addition, Airwheel has also designed a smart APP, which can be downloaded from the official website and wirelessly connected with A3 via cell phone. If riders want to know current speed, remaining electricity or riding time of scooter, just open the APP in the phone. Besides displaying basic real-time data, it also can help riders to adjust speed according to their preferences. More importantly, such an APP can align and detect the A3. All of these functions ensure the best riding experience. Whether a type of self-balancing scooter can be accepted by consumers is decided by the riding experience it brings. However, Airwheel A3 made it! Next：Why Airwheel Electric Scooters Have Been Popular Among Consumers for Such a Long Time?